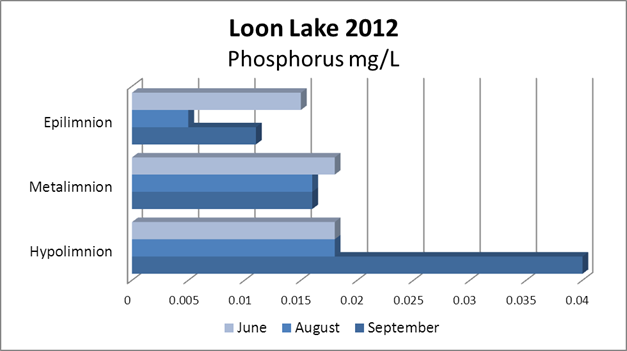 This is the sixth year of the Loon Lake Property Owners’ lake water quality monitoring program. 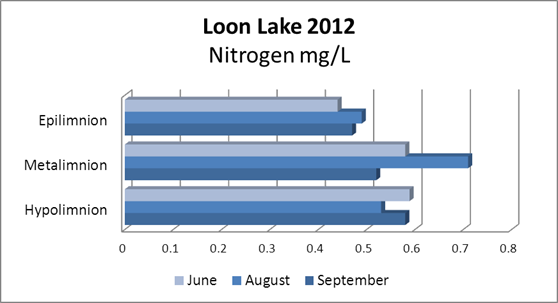 There now remains little room for skepticism regarding the extent to which Loon Lake water quality is deteriorating. Our collected data is convincing and it is now reinforced by the Washington State University Study presented to us in May of 2012. In the middle to late summer below 15 meters (49.2 feet) depth there is insufficient dissolved oxygen to sustain a healthy, deep/cold water Kokanee and Mackinaw fishery. 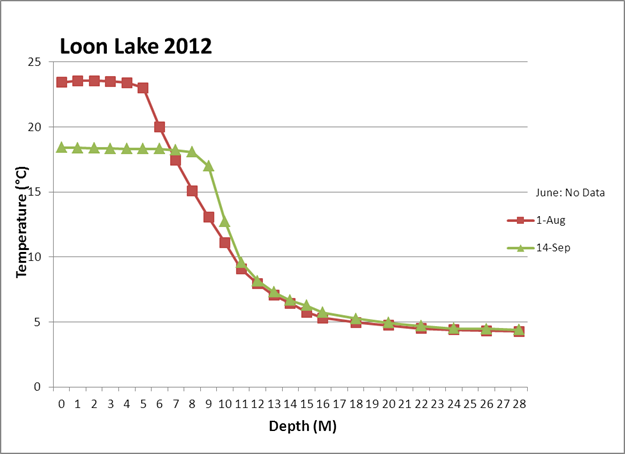 Ours and the WSU data also validate studies made for the Washington Department of Fish and Wildlife that pointed to an anoxic hypolimnion (oxygen deprived deep water below the thermocline) limiting Loon Lake salmonid habitat (Scholz et al, 1988, McClellan et al, 2005). WATER CLARITY: The clarity of the lake’s water is measured by submerging a Secchi disk until it disappears. In 1985 the Fisheries study conducted for the Department of Fish and Wildlife) by EWU reported a summer average of 6.5 meters (21 feet). 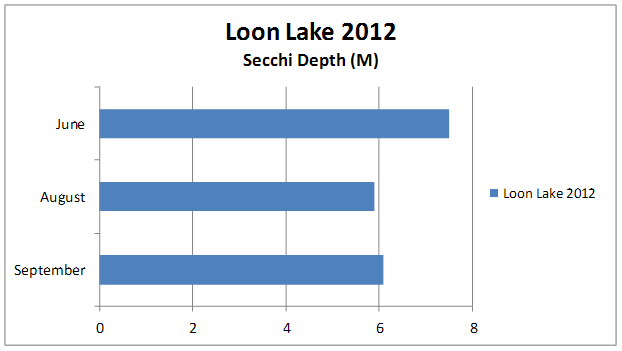 Secchi disk average measurements since then are as follows: (6.1 meters - 20 feet). Note: Measurements are also taken from top to bottom for temperature, dissolved oxygen, pH and conductivity with a Hydrolab Data Sonde. This instrument is calibrated before and after each use. It is used, stored and maintained by trained citizen volunteers. This year during calibration for the June foray the Sonde malfunctioned. It was sent twice for repair to the Manufacturer (Hach Environmental) making it impossible to gather data for June. TEMPERATURE: The temperature measured over depth for each foray is shown in Figure 2. It clearly shows typical summer stratification, a top warmer layer, the middle layer including the thermocline where the temperature drops quickly, and the cold bottom layer. 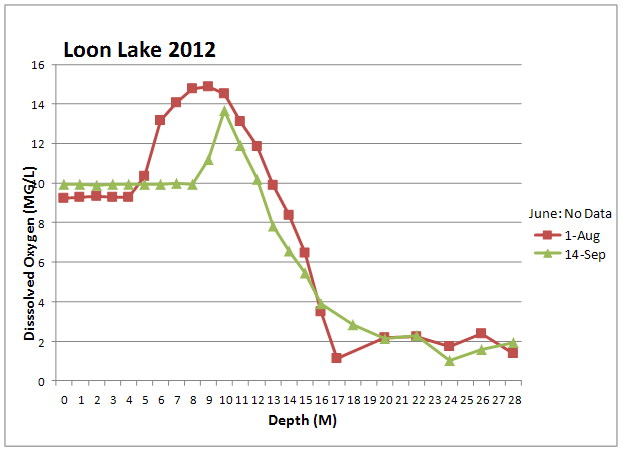 Figure 3: Loon Lake Dissolved Oxygen Profile -Note: DO is shown in milligrams per liter (mg/L). A milligram is one thousandths of a gram. NUTRIENTS: Nutrient samples are taken at the surface, half way down and at the bottom by use of a Kemmerer capture bottle. Analysis is done by the Spokane Tribal Laboratories. Elevated phosphorus (P) and Nitrogen (N) in the hypolimnion (deep waters) caused by the summer decay of organic matter can be seen in figures 4 and 5. These nutrients get remixed throughout the water column during fall turnover, fueling the next year’s algal growth. Sewer District #4 was formed to stop nutrients from entering the lake. It is important that remaining sources of nutrient loading be minimized. These sources include: Storm water runoff made worse by hardscape (roofs, driveways, roads, etc. ), fertilizer from landscaping and remaining septic system drain fields. It is also important to provide shoreline vegetative buffers and preserve wetlands in order to absorb nutrients (most importantly P) as they migrate toward the lake. All new development within the Loon Lake Watershed should be regulated by the County and State in such a way so as to retain wetlands in their natural state; minimize or prevent runoff; prevent contamination of the aquifer from sewage systems through the export of effluent to a location outside the watershed (as does Sewer District #4); and protect uplands from inappropriate development so that the aquifer may continue to be recharged by precipitation. CHLOROPHYLL a: Chlorophyll a sampling is done on the surface using a Kemmerer Capture Bottle. Two 300 ml. samples are blended from 100 ml samples collected at depths of 1, 3 and 5 meters. Sample bottles are wrapped in foil to protect them from light, are kept in cold storage until delivered (within two hours) to the Lab for analysis. Analysis results of the two samples are averaged. Note: Detailed original data including field notes, weather and surface conditions, volunteer staff present and techniques/methods/equipment used in collecting, protecting and transporting samples, etc. are not included in this report. If you need this information please contact J. Davies at 233-2651 or the Loon Lake Property Owners Association, Water Quality Project Chair.